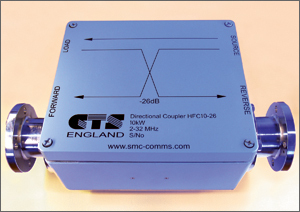 The HFC1-30 is a wide band directional coupler for the HF frequency band. Output samples of forward and reverse power flow are provided. Being effectively a “dual” coupler the reverse signal is largely independent of the load on the forward port (and vice versa). Built in load resistors dissipate any unterminated coupled power.